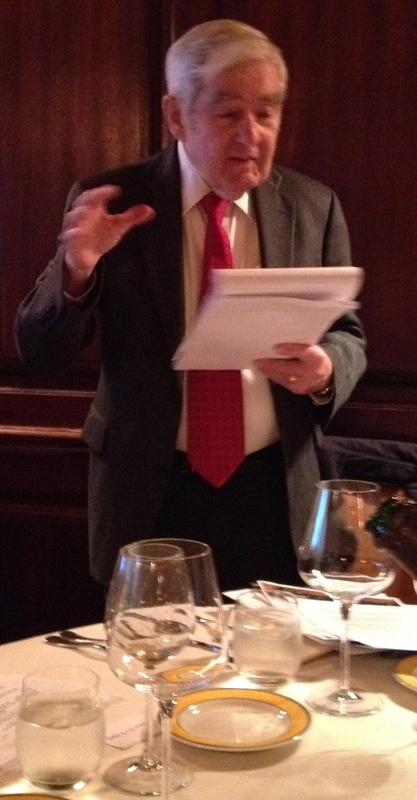 “Champagne Ed” Mc Carthy, author of Champagne for Dummies, presented 17 Blanc de Blancs Champagnes for the Wine Media Guild’s tasting and lunch at Felidia restaurant. Ed said that Champagne Blanc de Blancs (white from white) can only be made from the Chardonnay grape. Many Champagne houses believe in the traditional philosophy in Champagne that blending is better and therefore do not make a Blanc de Blancs. About 5% of all Champagne made today is Blanc de Blancs. Even though most Blanc de Blancs are lighter in style than the traditional blended ones, they can age and are best from 8 to 10 years from the vintage date. Fuller bodied Blanc de Blancs from the Grand Cru villages, such as Krug Clos du Mesnil, Salon and Taittinger Comtes de Champagne, can age for 15 to 20 years. 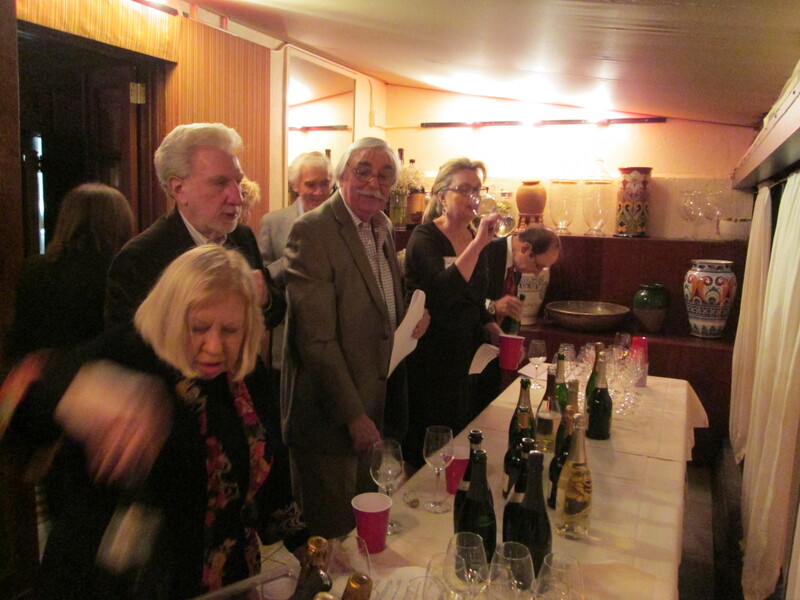 Ed said that the great years for vintage Champagne are 1996, 2002 and 2008, which are just coming on the market now. 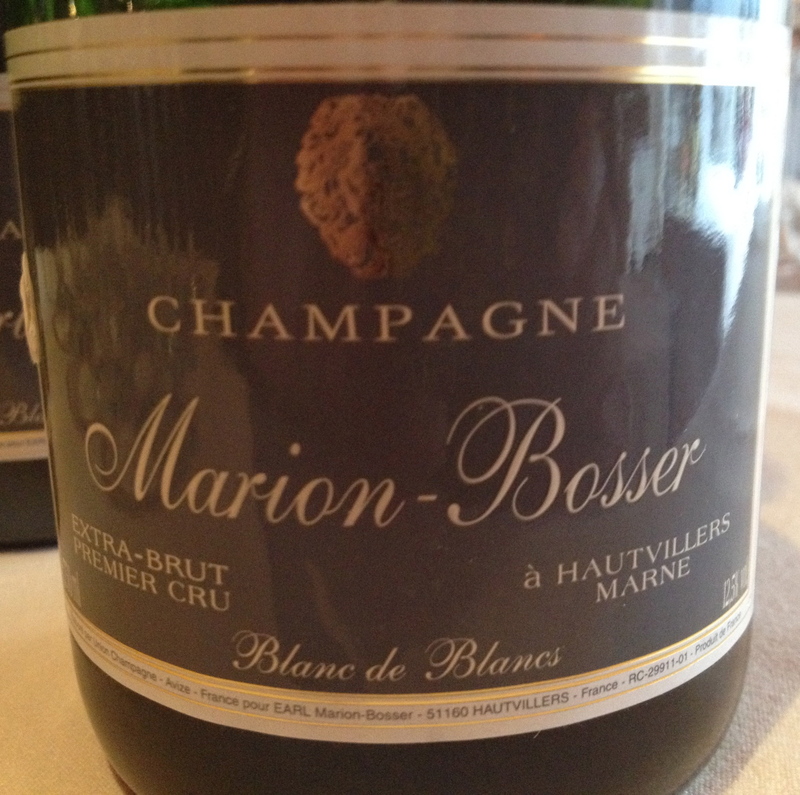 Marion-Bosser Blanc de Blancs, Extra Brut $55. This is one of the few biodynamic houses in Champagne. The winery is on the right bank of the Great Valley of the Marne, against the peaks of the Montagne de Remis. The vineyards are all Premier Cru. The soil is chalk beleminter from the Mesozic era. The wine spends three years on the lees. The dosage is 5g/l. It is a elegant Champagne with hints of apple and good minerality. A.R. 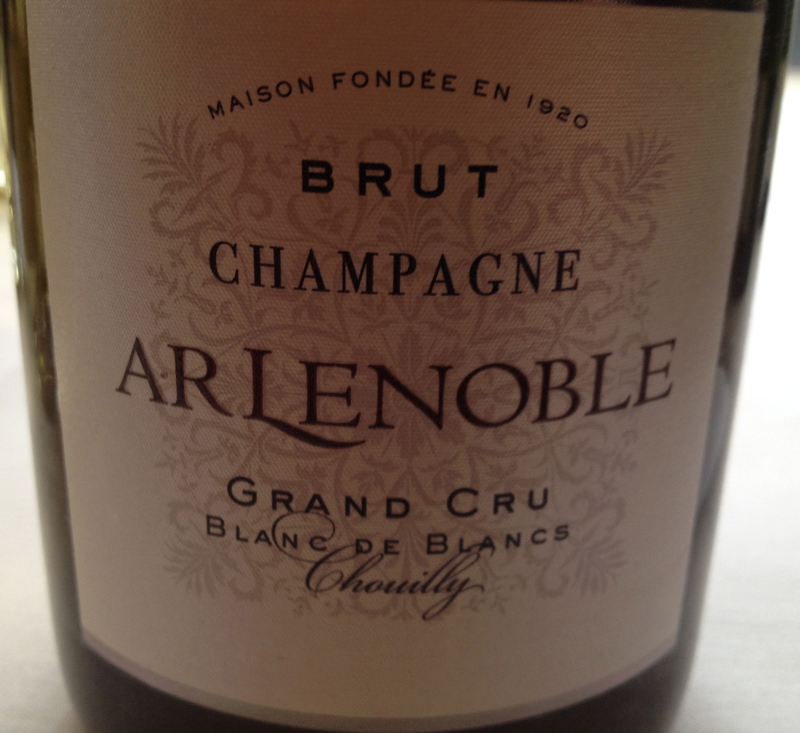 Lenoble Blanc de Blanc Grand Cru NV $55. Ed said this was one of the few independent and family run houses in Champagne. The 18 hectares of vines are all situated on Grand Cru and Premier Cru lands. The cuvee contains 13% of reserve wine aged in oak barrels for 5 to 8 months. The wine spends 4 years on the lees. This is a Champagne with hints of apple, pear, lemon and a touch of toast. 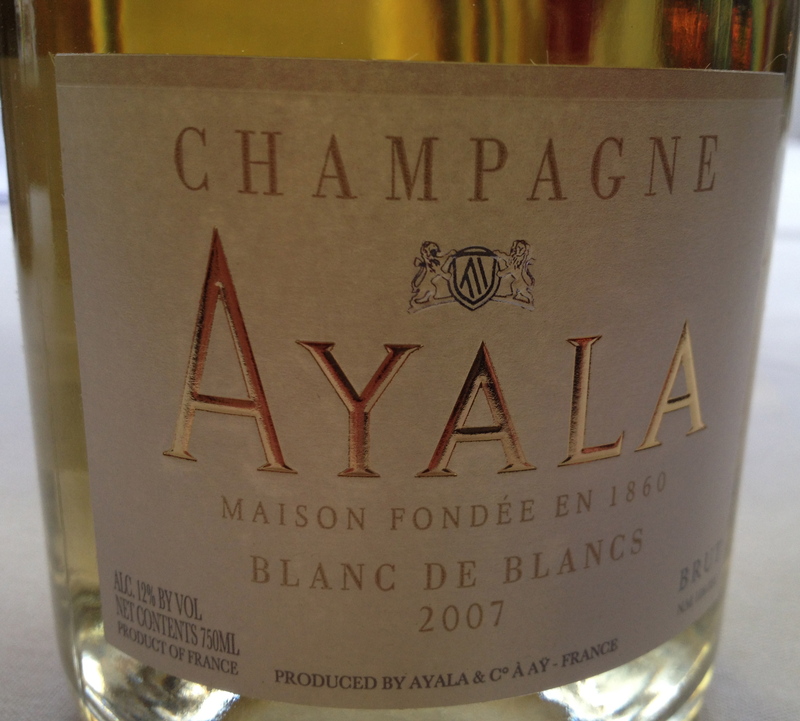 Ayala Blanc de Blancs 2007 $78. Grapes come from five villages in the Cote des Blancs: Oger, Avize, Cramart, Vertus and Cuis. The estate is 35 hectares in the heart of the Grand Cru of Montagne de Reims. The wine spends 6 years in the lees before release. Ed said that they were now owned by Bollinger but everything is done on the Ayala estate. This is Champagne with hints of citrus, pineapple and white flowers. 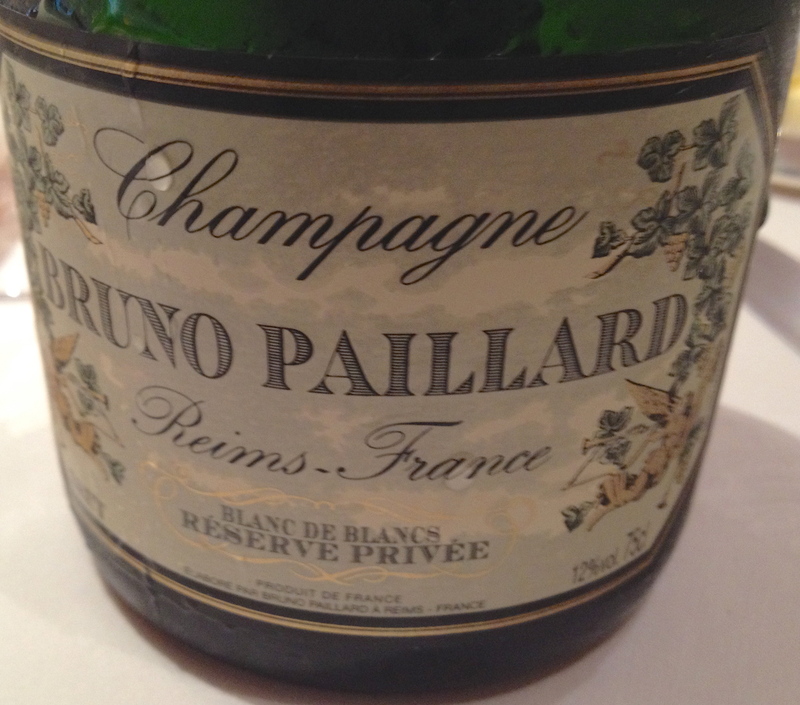 Bruno Paillard Réserve privée Grand Cru Blanc de Blancs NV $65 made from 100% Chardonnay grapes from the Còte des Blancs, all with a 100% classification. Ed said they use a fermentation method established generations ago for Champagne, “Demi Mousse.” When the still wine is decanted for the second fermentation in the bottle, less sugar and yeast is added than for traditional Champagne. This results in a less powerful bottle fermentation, producing a pressure of 4.5 kg instead of the normal 5 or 6. The dosage is 5 grams residual sugar. Ed said that this is perfect for Blanc de Blancs because it enhances the finesse of the Chardonnay and adds freshness and elegance. This is a complex elegant Champagne with an array of aromas and flavors with hints of citrus, white fruit, a touch of brioche, toasted almonds and good minerality. It has a long finish and very pleasant aftertaste. G.H. 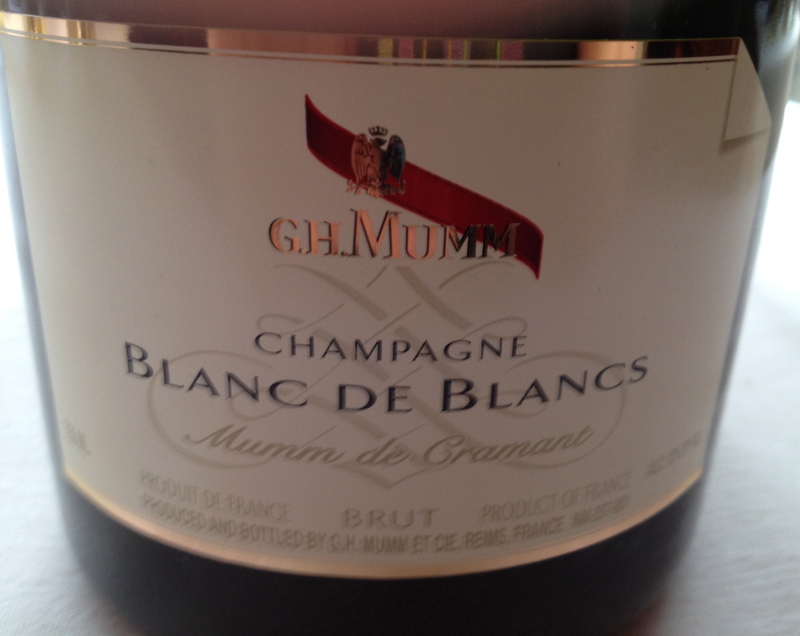 Mumm de Cramant NV $66. There are almost 218 hectares of vineyards rated 98%, which are mainly on the eight most renowned Grand Crus: Aÿ, Biuzy, Ambonnay, Verzy, Cramant, and Mailly-Champagne. 25% of the production comes from here, 75% is from independent growers. The grapes are picked between the end of September and mid October; about 100 days after the vines have flowered. As required by champagne appellation rules, picking is by hand. After pressing, the must is stored in vats for two weeks between 18°C and 20°C alcoholic fermentation. Malolactic fermentation always takes place but is not required by the appellation rules. In the cellars the liqueur de triage triggers a second alcoholic fermentation and the bubbles gradually form. As the bubbles form, the pressure inside the bottle increases, reaching as much as 6 bars. Ed said that in this wine there was less pressure so the bubbles were not as forceful. It was one of the first Blanc de Blancs Champagnes introduced in1930. It is fresh, crisp, dry, light bodied with nice fruit aromas and flavors and a touch of white peach. 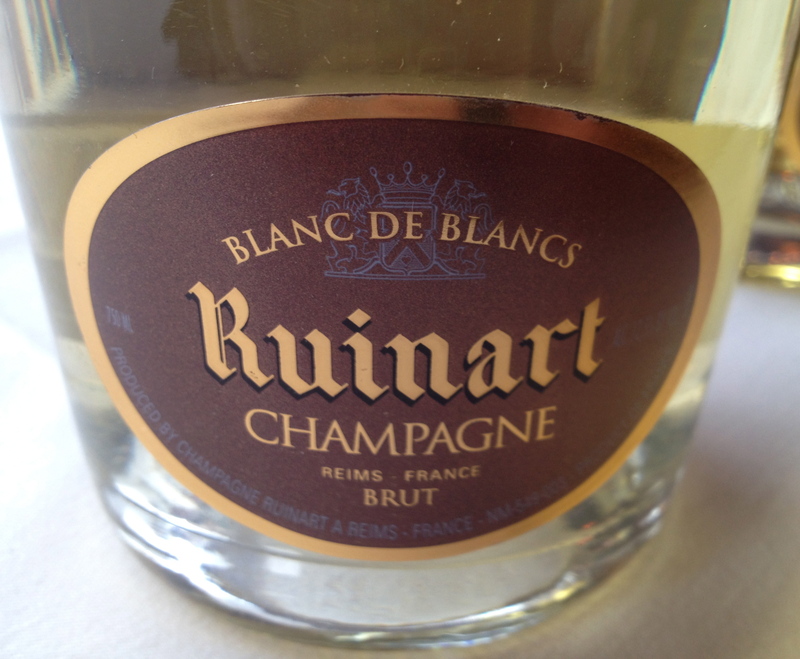 Ruinart Blanc de Blancs NV $68. Chardonnay is the very soul of the winery with grapes coming mainly from the Cote des Blancs, and Montagne de Reims terroirs. In the cool of the underground chalk tunnels, the wine slowly matures in the bottle. In 1768 Ruinart acquired former Gallo-Roman chalk quarries (the Crayères), hollowed out under the city of Reims to a depth of 38 meters. The site extends over three levels with eight kilometers of galleries. There is a constant temperature of 11°C with no vibrations and a perfect humidity level. This is a Champagne with nice citrus aromas and flavors with hints of apple and apricot. 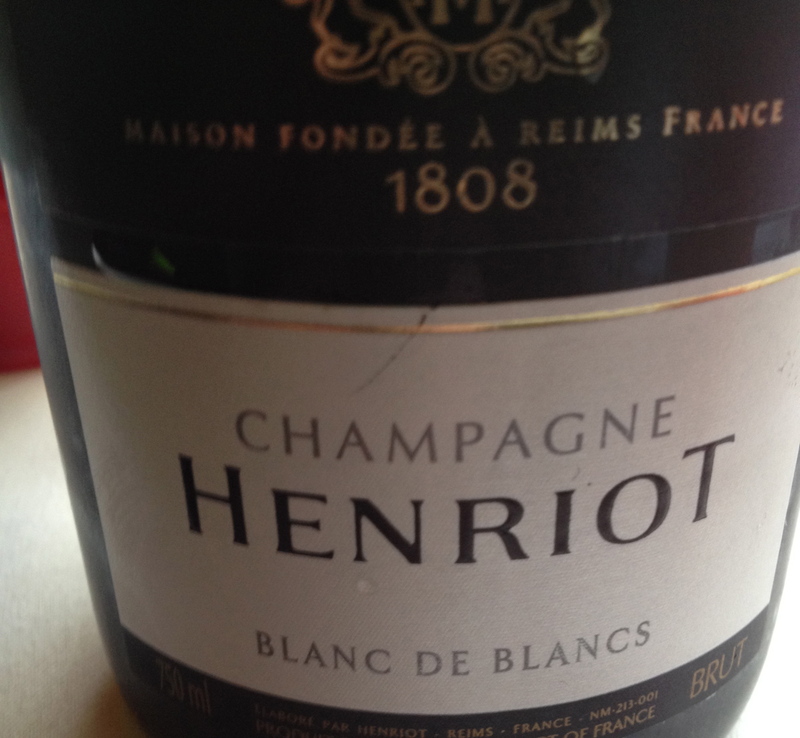 Henriot Blanc de Blancs NV $55. This is one of Ed’s favorite houses and one he feels does not get the attention it deserves. It is a blend of grapes from the Cote de Blancs and the villages of Mesnil, sur Oger, Avize, Chouilly and others. The assembly consists of 30% reserve wine, the percentage can change depending on the vintage. This is wine with hints of orange blossom, honey, apricot and a touch of brioche. 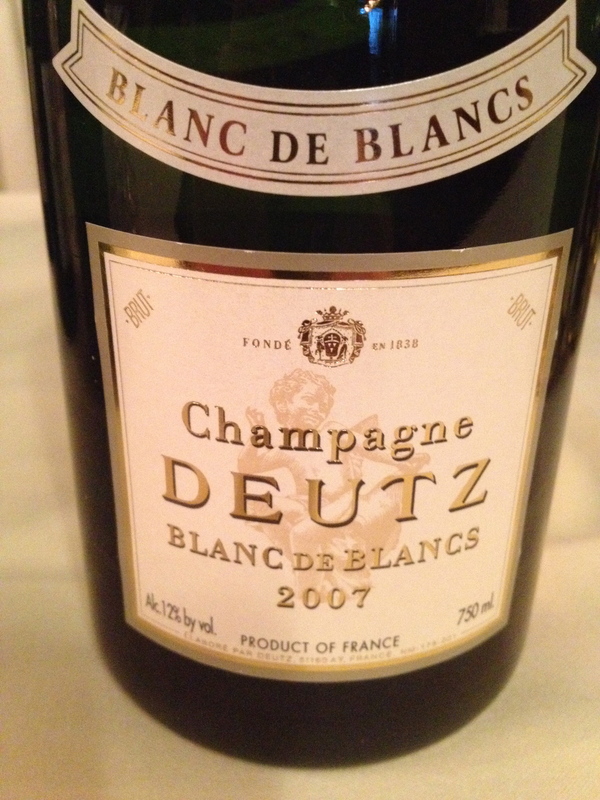 Deutz Blanc de Blancs 2007 $70. Ed said that even though the 2007 was drinking very nicely, the 2008 a better vintage, was going to be released at the same price. The firm is based in Ay, one of the 17 top-rated Grand Cru villages of Champagne. 75% of the grapes come from Grand and Premier Cru vineyards. The estate is spread over five villages. Each blend is in the same elegant signature bottle, in which it was aged on its lees for a minimum of three years. This is another of Ed’s favorites and also one that he feels is underrated. This is a Champagne that has a certain creaminess with hits of citrus fruit, white peach and a long finish.